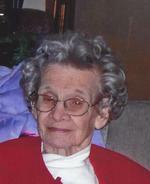 Kathryn Jane Lisius age 90, of Ashland, died Tuesday April 2, 2013 at her residence. She was born December 24, 1922 in Ashland, the daughter of Otto Leroy and Artie (Hershey) Mowery. Mrs. Lisius had been a lifelong resident of Ashland. She had been employed with the Dairy Bar for 14 years and later with A.L Garber Credit Union for 5 years. On August 31, 1940 Kathryn married Peter Lisius who preceded her in death in 1999. Survivors include her daughter, Kathleen (Don) Steininger of Ft. Wayne, IN. ; her son, Joseph Lisius of Ashland; her sister, Evelyn Gardner of Ashland; grandchildren, Kara Lisius, Neta Arif, Kisha Steininger, Joya Hart, David Jenkins; along with her 3 great grandchildren, Zeke Lisius, Devlin Miller and Cerena Miller. Kathryn was preceded in death by her parents; husband, Peter; and daughter Annette. A Memorial Service will be held at the Heyl Funeral Home on Friday April 19, 2013 at 3:30 P.M. with Pastor Dan Bilkert officiating. The family suggests memorial contributions may be made to the Checkered Pantry Animal Pantry 1130 E. Main St. NO. 136 Ashland, Ohio 44805.